In a surprise meeting, miles away from Cairo, hundreds of Wafd Party members agreed to withdraw confidence from party head El-Sayed El-Badawi, prompting him to freeze the membership of some of the masterminds behind the move, signaling an open dispute between the dissident members and the leader of Egypt’s oldest political party. At least 1,200 members of the right-of-centre Wafd Party met in the Nile Delta governorate of Sharqiya governorate Friday, announcing their withdrawal of confidence in El-Badawi, high board member Essam Sheha told Ahram Online. Sheha described businessman El-Badawi, who was elected party head in 2010, as misusing his powers, having absolute authority in all party decisions, and running the Wafd as if he were managing one his company's branches. The members convened in Sharqiya commissioned 16 members of the high board with responsibility for managing the party until a new legal party representative is chosen. Wafd Party bylaws say only 500 members are necessary to withdraw confidence from the party’s head. In quick retaliation, a few hours later, an emergency high board meeting was held at the party’s headquarters in Cairo and El-Badawi announced that eight high board members, including Sheha, were suspended and referred to investigation. “Everything said is untrue, it’s all personal disagreements between El-Badawi and the opposing party members,” Party Spokesman Bahgat El-Hossamy told Ahram Online, defending El-Badawi. El-Hossamy described the Sharqiya meeting as ”media propaganda promoted by rogue party members". “They didn’t exceed 300 individuals. If they were indeed more than 500 people they would’ve been able to withdraw confidence from [El-Badawi],” El-Hossamy said, adding that the names of those who oppose El-Badawi weren’t presented. Sheha, on the other hand, questioned the legality of the Cairo meeting since the high board had been previously dissolved. Last week, El-Badawi announced it was the last meeting of the high board until elections take place on 15 May and a new board is formed. However, El-Hossamy stated that bylaws of the party permit emergency high board meetings, even if the high board was dissolved prior to new elections. On the reason for why the members held the meeting in Sharqiya governorate and not in the party’s Cairo headquarters, Sheha revealed that El-Badawi hired a private security company last week. Security guards have special lists of who to let inside and who to turn away, Sheha stated. El-Hossamy, on the other hand, had a different reason for the appointment of security guards at the party headquarters gate. He said the party had received “threats” and took such threats seriously as they were previously attacked. “Our headquarters was attacked [in December 2012], had Molotov cocktails thrown at it, and its historic glass was shattered,” he added. 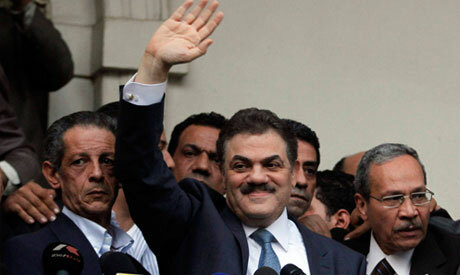 “No one can prevent members of the high board from entering [the headquarters],” El-Hossamy stressed. Sheha, now suspended and under investigation, had a number of complaints against El-Badawi, including that the latter had abstained from revealing the budget of Al-Wafd for the past five years. He added that secrecy around the budget comes at a time when, according to Sheha, there are rumours that Al-Wafd is going bankrupt. However, El-Hossamy said the party’s budget has been presented last week in the high board meeting, and it was also presented in a meeting in April 2014. The selection of the new legal party representative will take place on Sunday, according to Sheha, with members attending the meeting. The party’s internal dispute comes at a time when Egypt lacks parliamentary representation since 2012. In April, El-Badawi issued statements calling on other political parties not to rush calls for parliamentary elections and to give enough time for relevant laws to be redrafted and verified as constitutional. Egypt’s President Abdel-Fattah El-Sisi currently holds legislative powers until a new parliament is elected. The Wafd Party, Arabic for “delegation”, was established in 1918 as a mass movement to support an Egyptian delegation going to the 1919 Paris Peace Conference to demand the country's right of self-determination and sovereignty from the British occupation. The British prevented the delegation from travelling to Paris. However, the party remained a fixture on Egypt's political landscape ever since, at times representing the voice of the people and at others stagnant with little political influence. What do you stand for today, not in 1920? The Wafd Party had a purpose during the British occupation. 60 years now; what has the party really accomplished? This is not a cheap shot or derogatory comment, it is a genuine question to the Party officials? No Economic plan to speak of, how will you govern to solve our problems: Education, Unemployment, Deficits, Economic Growth? How are you going to reduce religious extremism, how are you going to bridge the chasm between Egyptian Muslims and Christians, how will you elevate Egyptian women …. Too many question, don’t seem to have had answers over the last 60 years? Any party spokesperson care to comment … What do you stand for today, not in 1920 ?